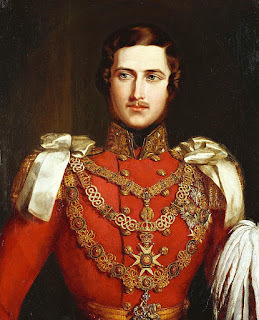 the men, at least in the palace, are still wearing stockings and knee-breeches as if it were the Regency era. The common people are agitating for wider voting rights. I suppose the 1840s were a transitional time. But at the center of it all is a merry eighteen-year-old girl who has been brought up in a very sheltered environment. Her father died when she was an infant and her German mother doesn't like the licentiousness of her in-laws. 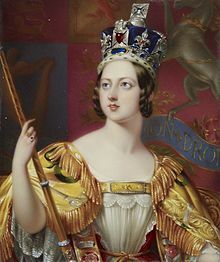 But Victoria, all four feet and eleven inches of her, is a very determined young monarch, though in need of guidance in the guise of her prime minister Lord Melbourne. But now she's married Albert, her first cousin, and the man that we all know Victoria would wear black for for over sixty years. 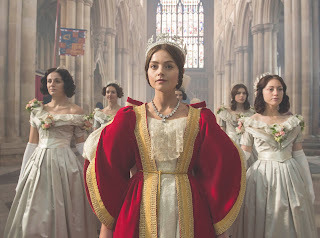 It's an interesting, dramatic look at a young Victoria and times in which she began her rule. By 1901, when she died and the Victorian era came to an end, the world had changed drastically. I like Rufus Sewell! Those are good portraits. Who needs cameras? Those are much better. It's hard for me think of Victorian times these days without steampunk images leaking out of my brain. It's hard for me to think of the Victorian era without immediately going to the 1890s and my novel's time period! Rufus Sewell is very good in this--the casting is top notch. It's just, I never really gave much thought to the beginning of her reign, you know?